This month I co-authored an article for the Market Research & Intelligence Association titled, 'Milking Memories.' Appearing in VUE Magazine, the article shared findings from two years of research we conducted on behalf of the Canadian dairy industry. If you'd like to read the original article you can view it here, alternatively a transcribed version is available below. To start this article, let’s go back – way back into your childhood. What are your earliest memories of milk? What do you remember doing, seeing and experiencing in relation to milk? How do these memories make you feel? If you’re feeling warm and fuzzy, you may be experiencing nostalgia, a physiological state that’s been shown to make people feel loved, protected and physically warmer (Zhou et al., 2012). It may seem strange to start a research article recalling experiences of childhood nostalgia, but not when the article explores the topic of food. Amongst the most frequent of human behaviours, eating and drinking are influenced by a complex range of social and psychological factors (Morin-Audebrand et al., 2012). Because milk is the first food consumed in childhood, the motivations surrounding it can be particularly complex. So how did a group of Canadian marketers come to terms with these complexities and develop a new marketing direction for milk? That’s the focus of this article and almost two years of quantitative and qualitative research. This article will take you, from project background to final creative, through the five steps that led to the development of the new Milk Every Moment marketing campaign. Back in March 2011, Milk West – a joint venture by the BC Dairy Association, Alberta Milk, SaskMilk, and the Dairy Farmers of Manitoba – began a process of marketing research and strategy designed to uncover milk marketing opportunities across Western Canada. Despite the success of previous marketing campaigns that were focused on youth and nutrition, there was growing concern in the group that changes in demographics, eating patterns, and milk perceptions may be contributing to a decline in consumption. To find ways of addressing the decline, we began a research process involving surveys (n=3,919), morphological interviews (n=51), group discussions (n=91) and online testing (n=776) with teenagers and adults across Western Canada. From the outset, opinions and anecdotal evidence raised a confusing array of target audience opportunities for milk - including baby boomers, urban parents, regional teenagers, and recent migrants. To properly assess the validity of these opportunities, the first step in the research involved measuring milk consumption in all potential target audiences. By measuring the amount of milk each respondent consumed on a weekly basis, we quickly discovered that gender was, in fact, the variable most consistently associated with lower levels of milk consumption, in particular, among females. While no significant difference in consumption could be observed between females and males at the age of 13, by the age of 17 average milk consumption among females was 31% below that of their male counterparts. Furthermore, this decline persisted into adult years, with females aged 30-49 consuming an average of 16% less milk than their male counterparts (see figure 1). Given this significant pattern of underconsumption by females, it became clear that the future marketing priority for Milk West should be centered on addressing this decline. Over the past fifty years, numerous marketing campaigns have been developed to promote the rational and nutritional benefits of milk consumption. While messages related to calcium and strength formed an important foundation in the promotion of milk, little had been done to assess the impact of these beliefs on consumption. Hence, step two in the research process set out to measure the impact of these beliefs, using a range of factual statements (e.g., milk is good for bones, prevents osteoporosis, and is important for muscle growth). Interestingly, despite almost universal levels of agreement with these statements, regression analysis found that only 3% of milk consumption could be explained by these beliefs. This finding was important for Milk West, because it challenged many of the conventions associated with milk marketing and made a case for exploring new motivations. Since rational and nutritional beliefs couldn’t explain milk consumption, step three in the research process was designed to explore emotional beliefs and motivations. To carry out this research properly, a series of 90-to-120-minute depth interviews were conducted using the theoretical framework of morphological research. Developed by Prof. Salber, from the University of Cologne, Germany, morphological research is based on psychological tensions in everyday human behaviour (Salber, 2001). Unlike other research techniques, which often focus on surface ideas and rational responses, morphology is designed to explore underlying and often unconscious motivations (Ziems, 2004). Using morphological research, we developed a model to help explain the emotional needs and motivations underlying adult and teenage milk consumption. 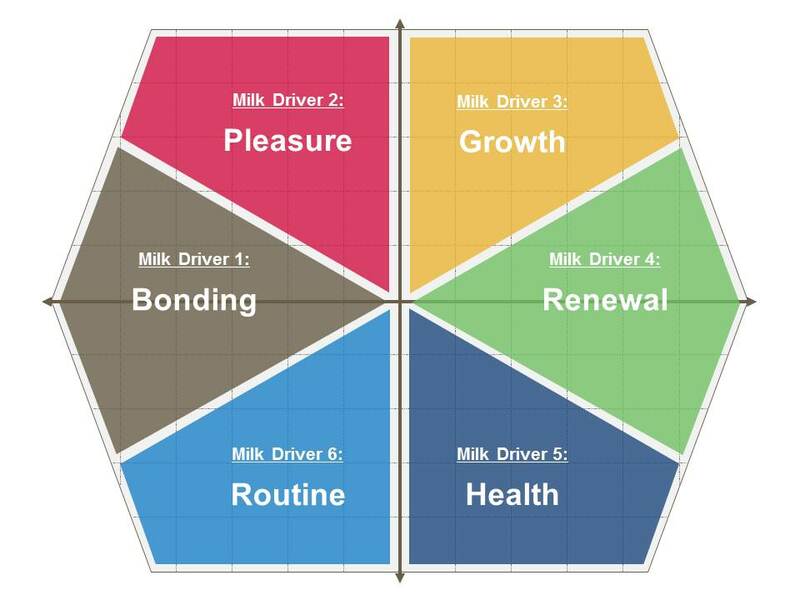 This research uncovered six drivers of milk consumption that work in tension with each other to form a hexagonal model (see figure 2). Although all six drivers provided opportunities for influencing milk consumption, the research found that the bonding and pleasure drivers, which formed an important basis for milk behaviour, could provide Milk West with an opportunity to reactivate consumption by females. Using the milk motivations model to guide development, step four in the research process involved creating and testing a range of new milk messages. In collaboration with the advertising agency DDB Canada, nine messaging options were prepared for testing with teenagers and adults across Western Canada. Through the use of group discussions and online testing, two of these messages emerged as clear and consistent favourites. Based on clear and consistent results from message testing, we recommended that Milk West move forward with a new marketing campaign that targets females across Western Canada using one or both of these bonding and pleasure messages. In June 2013, after two years of research and strategy development, Milk West and DDB Canada launched the new Milk Every Moment campaign. Highlighting a range of nostalgic childhood experiences like sticking your tongue to a frozen pole or having a glass of milk with cookies, the new campaign was designed to encourage females to “release their inner child and drink milk with their favourite foods” (see figure 3). Appearing on television, in-store, online, outdoors, and in social media, the campaign is ongoing, and final tracking results are yet to be fully analysed. However, early measurements indicate that the campaign is having a positive impact on females’ milk perceptions and consumption intentions across Western Canada. For anyone who is interested in seeing the campaign in more detail, check out the YouTube Channel or the commercials below. To end this article, let’s go back – way back into your childhood. Providing an important foundation for the way we think about many categories, childhood memories and experiences often have a profound influence on everyday consumer motivations and behaviour. From food to finance, exploring these early memories and experiences can provide marketers and marketing researchers with a wealth of unique insights and marketing opportunities. So, next time you’re considering the future of your market, perhaps you should try exploring the past. You never know: you might discover some memories worth milking. interesting piece, Nick! Hadn't considered how important the feeling of nostalgia would be for milk! Thanks Ami - glad you enjoyed it. Loved it! And yes, in my one year's experience in qual marketing research, I have done some interesting work in the category of food and beverages and have loved moderating for these. Its true, food evokes nostalgia, its an important cultural artifact, people do remember the taste of their mom's food, they feel special about the way they feasted with their families on festivals or how they would stop for a snow cone made by a street vendor on a hot day, while coming back from school. It leads to important insights.